Luke 17 : 6 And the Lord said, If ye had faith as a grain of mustard seed, ye might say unto this sycamine tree, Be thou plucked up by the root, and be thou planted in the sea; and it should obey you. Jesus disciples came to him and asked him to increase their faith. How could this be. A mustard seed is as tiny as the period at the end of this sentence, yet Jesus said if we had faith as a grain of mustard seed, we could command a tree or even a mountain to be cast into the sea, and it would obey us. A mountain is anything in our lives that hinders us from being more Christ like, or anything that is contrary to God’s will, or opposes his kingdom. God wants only good things for us, and in return wants us to give good things to others. We have to receive in order to give. Not knowing how to use our faith, hinders our ability to receive. Back to the mustard seed, notice Jesus said if ye had faith as a grain of mustard seed, not as big as a grain of mustard seed. Luke 13: 18 Then said he, Unto what is the kingdom of God like? and whereunto shall I resemble it?19 It is like a grain of mustard seed, which a man took, and cast into his garden; and it grew, and waxed a great tree; and the fowls of the air lodged in the branches of it. Jesus gave a parable to describe what the kingdom of God was like, he again used the example of a grain of mustard seed. God created all things to function and work as he created them. A mustard seed does not question what it will become, it does not have the ability to doubt, or worry, or question what its end shall be. Man on the other hand, has been given the intellect to question God, and believe what he sees, over the word of God. Hebrews 11: 1Now faith is the substance of things hoped for, the evidence of things not seen. To have faith as a mustard seed, is to not look at our circumstances as we see them, but to see them as God sees them, filtered through his word. Speaking of Abraham, Paul wrote this to the Roman’s 17 (As it is written, I have made thee a father of many nations,) before him whom he believed, even God, who quickeneth the dead, and calleth those things which be not as though they were. Romans 4:17. Paul said God calls those things that be not as though they were. Jesus did not look at a few small fish, and a few loafs of bread and say, ” this will never feed so many thousands, what on earth will we do?” Abraham did not look at his old body, or that of Sarah’s and say, “we will never have children, it’s impossible!” Romans 4; 18 Who against hope believed in hope, that he might become the father of many nations, according to that which was spoken, So shall thy seed be.19 And being not weak in faith, he considered not his own body now dead, when he was about an hundred years old, neither yet the deadness of Sarah’s womb:20 He staggered not at the promise of God through unbelief; but was strong in faith, giving glory to God; If we rest in God’s word, and believe in it, it will come to pass. It may not be as soon as we want it, God does not want spoiled children who have to have everything immediately. James 1: 2 My brethren, count it all joy when ye fall into divers temptations;3 Knowing this, that the trying of your faith worketh patience.4 But let patience have her perfect work, that ye may be perfect and entire, wanting nothing. The trying of our faith produces patience. 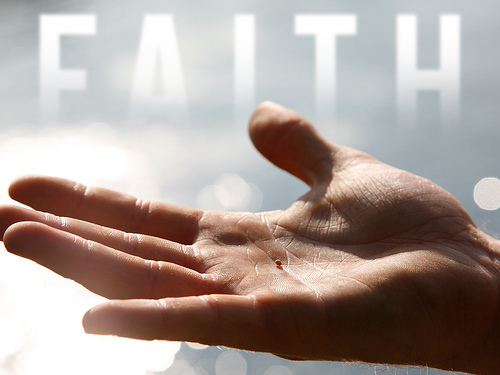 Finally, to have faith as a grain of mustard seed, we must believe God, and not the circumstances we find ourselves in. Psalm 37 : 4 Delight thyself also in the Lord: and he shall give thee the desires of thine heart.5 Commit thy way unto the Lord; trust also in him; and he shall bring it to pass.6 And he shall bring forth thy righteousness as the light, and thy judgment as the noonday.7 Rest in the Lord, and wait patiently for him: This Psalm mentions resting in the Lord, and trusting in him. This is what the mustard seed does. It does not say, “look how small I am, I will never become a great tree, birds will never lodge in my branches.” We simply need to believe what God says about us, and about our circumstances, as little children believe their earthly parents. Luke 18: 17 Verily I say unto you, Whosoever shall not receive the kingdom of God as a little child shall in no wise enter therein. ← God helps those who help themselves.